I have a linear sequence of many same-sized rectangles. I need all of the edges to be touching. 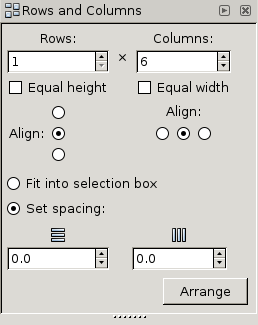 Of course, I can manually select sequential pairs of rectangles and use Align & Distributes option align left edges of objects to right edge of anchor. But this is very tedious - I have to do it for every sequential pair. Is there any way to sequentially align the edges in bulk? Yes, you can use Object > Rows and Columns... to distribute objects into... rows and columns. Just set the spacings to zero, and the number of rows to 1. The number of columns will be calculated automatically from the number of selected objects. Not the answer you're looking for? Browse other questions tagged inkscape automation alignment or ask your own question. Align edges: How to choose which element aligns and which one stays? How to align rotation of a triangle to a rectangle in Inkscape?